When logistics companies are looking to increase efficiency, one of the best ways they can do so is by investing in equipment that helps their workers complete tasks with greater ease. This includes the forklift, which has long been a part of many warehouse operations. When companies invest not only in new equipment itself, but also proper and more effective use of it, everyone involved can benefit significantly. Technology has provided a litany of approaches logistics businesses can take to make better use of forklifts these days, including by enabling every vehicle with tracking devices that allows sensors to track its location throughout a building, according to Inbound Logic. This allows them to collect better information about how equipment is used, how much mileage is being put on it and its various paths through a warehouse facility as a means of identifying potential need for maintenance or determine more efficient routes for getting loads from Point A to Point B on a regular basis. Enabling this kind of technology across a facility can help improve operations by large margins by reducing risk, lowering downtime and improving maintenance schedules so that everything works at its optimal level, the report said. Best of all, these systems can often be installed for more or less the same cost as less advanced platforms based on passive RFID scanning, which also help improve efficiency, though usually not to the same level. At the same time as many companies are thinking about how they can use warehouse equipment more efficiently, there are also developers striving to improve the efficiency of the machinery itself, according to Business Green. For instance, Mitsubishi is increasingly developing all-electric forklifts that last longer on a single charge and therefore improve the operational efficiency of any warehouse using that kind of equipment. 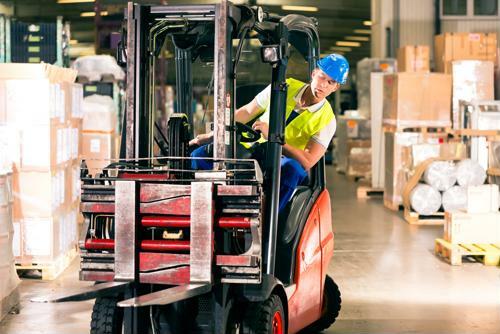 While electric forklifts have been around for some time, they had the same issue as the all-electric cars that existed even a few years ago: Their batteries died quickly and had to be recharged multiple times throughout a single workday, the report said. But with battery technology advancing at a rapid rate, many forklifts - which are themselves becoming more efficient, such as with reduced turn times - can operate a full day on a single charge and, consequently, improve system up-times in a way that was not possible even somewhat recently. That may add up to dozens or more work hours saved per year. It's also a good idea for companies to think about how they will streamline operations in other ways, according to Modern Materials Handling. For instance, there are options to invest in different types of warehouse equipment that uses the same kind of battery, which improves efficiency by allowing for investment in large quantities of a single battery type. That, in turn, allows employees to swap out dead batteries in a forklift, pallet jack or other device for a fully charged option, with greater flexibility. Another way to increase efficiency is by simply hiring or training workers with the latest and greatest warehouse skills, and retaining them long term. To keep those employees around, it's critical to offer high hourly wages and strong benefits packages, among other perks.